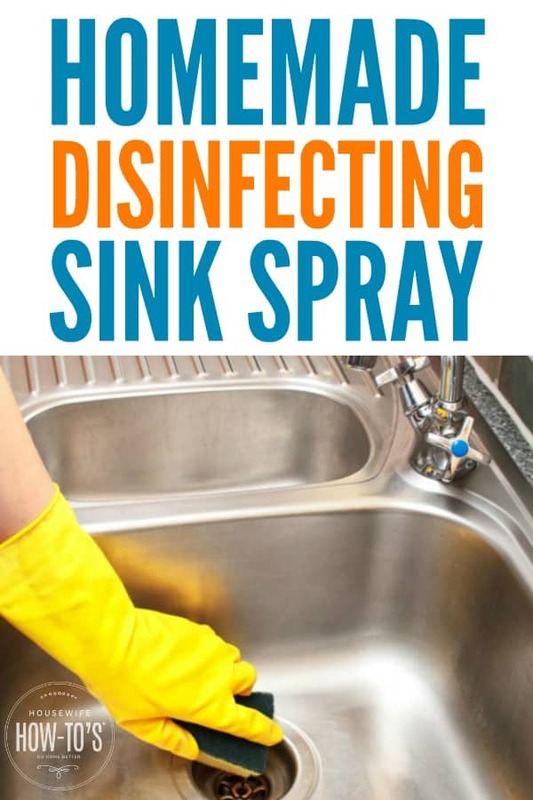 This Daily Sink Spray is one I created and began using after reading that most kitchen sinks are dirtier than toilets. Despite my best efforts, my family continues to think of the kitchen sink as their go-to spot for hand washing. Just took the trash out? Did some yard work? Cleaned cat puke off the floor? It never fails: those hands get washed in the kitchen sink while I stand there glaring. After a few years of that, I realized I’ll never get my family to change — but that doesn’t mean I have to put up with a filthy sink, either. So I decided to create a spray that would kill germs. While I was at it, I wanted something that would treat odors and leave a beautiful shine on my stainless steel sink. Oh, and I wanted it to work on bathroom sinks, too. Although scrubbing the kitchen sink and wiping the bathroom basins are part of my daily cleaning routine, I wanted something to use when the sink needs a bit of extra attention. Like when my son banged the mud off of his tennis shoes in the kitchen sink the other day or any time I cook raw chicken. This spray draws its disinfecting power from 70% rubbing (isopropyl) alcohol, which UK readers know as “surgical spirits.” The few drops of soap contained in the solution break through the surface tension of grime, so the rest of the ingredients can do their work. In this recipe, the essential oil isn’t optional. I used lemon essential oil because it deodorizes and shines. Also, since lemon essential oil doesn’t contain citric acid, as fresh lemons would, it’s safe for granite and marble, too. 1. Add all ingredients to the spray bottle then swirl gently to combine. 2. For regular cleaning, liberally spray the mixture on the surface then wipe with a clean microfiber cloth. 3. To disinfect, spray after cleaning until the surface is thoroughly saturated then wait 3 minutes before wiping it dry with a clean cloth. 4. Store in a cool, dry place. Rubbing alcohol is flammable, so keep it away from heat. Try These Homemade Cleaners, Too. If you’re a fan of making homemade cleaners, here are some more to try. They’re all inexpensive and easily created using ingredients you probably already have. Most importantly, they avoid unsafe homemade cleaning combinations and harsh fumes that can damage your family’s health. Love this. My sinks NEED this. Trying today. You have wonderful ideas. I would love for you to share them at my linky party http://faithfilledparenting.com/2015/12/faith-filled-parent-link-up-party-2/. Blessings! Thanks for sharing your recipe. I make my own cleaners, too – have for years. It is very easy and a lot less expensive. I look forward to trying this one – yours has more alcohol and less castile soap than the one I currently make. I love homemade cleaners. Since the purpose of this one is to disinfect, the alcohol level is high. Castile soap is a fantastic cleanser, but it doesn’t have the same disinfecting power. And, since vinegar cancels out Castile soap, I needed to go with a different disinfectant. As a food blogger my kitchen sink takes a beating. Definitely making this and using it several times a day. I hear ya, Stephanie. My kitchen gets a serious workout on recipe development days! Feel free to use any essential oil you like; that’s in there to offset the rubbing alcohol’s smell. This sounds wonderfully simple and effective. Thank you for sharing it! Stopping by from Wow Us Wednesday. Pinning! You’re welcome, and thanks for the Pin! can I use Orange essential oil instead? It’s the one I have so I don’t have to go buy something different. Glad to hear that since I have some leftover orange essential oil! 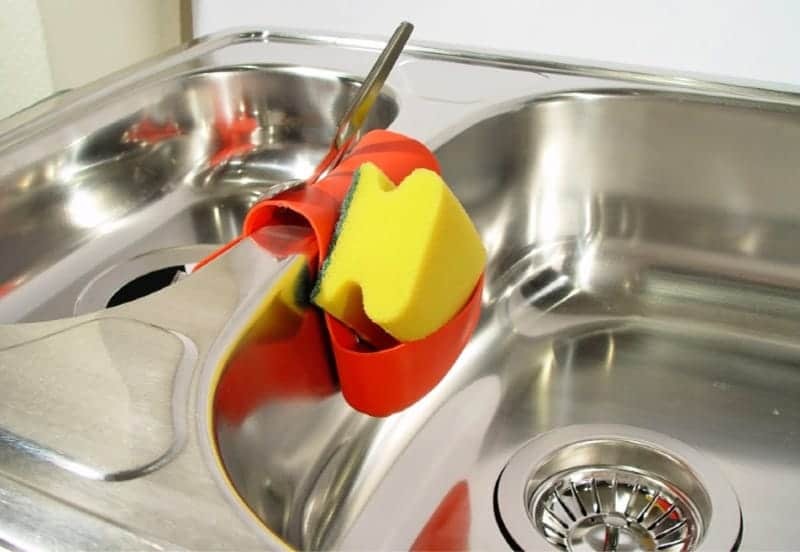 Oh I cringe to think of how dirty my kitchen sink is – yuck!!! Thanks for sharing this spray recipe, I’ll give it a try! Can I use Dawn in place of Castile soap? Thank you for this! It makes me crazy, too, when members of the family wash their hands in the kitchen sink after working in the yard, on the car, anything. I really thought I was the only one who felt that way. Nice to know I’m not alone.